Q. 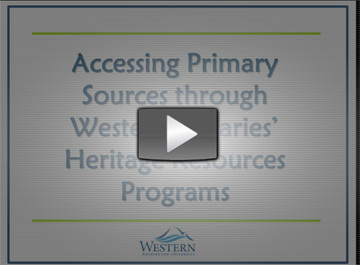 What and where are the Heritage Resources programs? Where are the Archives and Special Collections on campus? Western Libraries Heritage Resources unit provides for responsible stewardship of and access to unique and archival resources in support of teaching, learning and research at Western Washington University and beyond. The Center for Pacific Northwest Studies, Western Libraries Special Collections, and WWU Archives and Records Center work together to document the culture and history of Western, the local community and Pacific Northwest region, and to promote public and scholarly access to holdings. Although the three Heritage Resources programs all belong and report to Western Libraries, they are physically located in two seperate buildings: Western Libraries' Special Collections is located on the 5th floor of the Wilson Wing of the main library. Both the Center for Pacific Northwest Studies and WWU Archives and Records Center are located in the Goltz-Murray Archives Building on Bill McDonald/25th St. The Goltz-Murray Archives building is also home to the NW Branch of the Washington State Archives.